Ireland Bailout Consequences for Britain, Portugal Next? Stock Market Correction Over? The key bailout test was whether or not Ireland would retain its 12.5% Corporation Tax, which has attracted a number of giant multi-nationals to relocate to Ireland such as Google, Pfizer and Microsoft, much to the annoyance of other European countries, and especially France and Germany who had this at the top of their conditions hit list. The fact that Ireland has apparently retained sovereignty over corporation tax bodes well for eventual economic recovery as the relocated multi-nationals account for more than 70% of Irelands exports and generate more than 50% in corporation tax revenues, without which Ireland truly would be bust for the next decade. However whilst Ireland can claim victory on capital gains tax, it did pay a heavy price elsewhere as it effectively handed over economic sovereignty to the ECB for at least the next 3 years. E.U. financing of Irish government deficit for the next 3 years (Euro 40 billion). International Bond Markets effectively closed to Ireland for the next 3 years. Ireland's bankrupt banks to be fully nationalised (re-capitalisation) then broken up (Euro 50 billion). Ireland to enact further tax rises and spending cuts aimed at reducing the budget deficit to 3% of GDP by 2014. Ultimately much of the bailouts debt will have to be inflated away by higher Eurozone inflation(stealth debt default), especially as other PIIGS are also lining up for a bailout, coupled with restructuring of Irish banks debts (outright debt default). "There will be a large loan because the purpose of the amount to be advanced, or to be made available, is to show Ireland has sufficient firepower to deal with any concerns of the market, so we're ’re talking about a substantial loan, tens of billions, yes." The press has been full of commentary of a bailout for Ireland as news, when it has been an INEVITABLE eventuality given the fundamentals (13 Apr 2010 - Britain's Accelerating Trend Towards High Inflation and UK Debt Default Bankruptcy ) (Graph now needs updating following developments of the past 8 months). The bailout has been on the card not just for the last few weeks or even the whole of 2010, but a bailout of Ireland has been on the cards since it first bailed out its three big bankrupt banks back in late 2008. Ireland had only managed to DELAY the INEVITABLE purely as a consequence of being IN the Eurozone which allowed Ireland to borrow at very low interest rates and without suffering an inflationary currency collapse that hit Iceland hard when its banks blew up in September 2008 and the money markets completely froze to financing of both Icelandic banks and the state which required an immediate E.U./ IMF bailout just to keep Iceland's economy ticking over on life support. So whilst an angry Irish population may blame the Euro-zone / ECB, need to realise the facts that the Eurozone has saved Ireland from a far worse economic catastrophe Iceland style and therefore if they need someone to blame they first need to look at their banks which have been haemorrhaging deposits to the tune of Euro 25 billions over the past few weeks, and then at their lying politicians and finally in the mirror at themselves for ratcheting up personal debts on the basis of cheap Euro-zone cash, where the Irish state and banks were able to borrow as though it were Germany but without any of the regulatory framework, discipline or deep financial pockets that Germany has. The markets have immediately reacted strongly to the news by bouncing higher in asia, as some uncertainty has now been removed from the market place, though there is plenty of room for more market / eurozone wobbles especially as Portugal which is in an even worse state than Ireland teeters on the brink of a bailout, with Spain not far behind. I highlighted possible solutions in an earlier article (14 Nov 2010 - Bankrupting Ireland in Economic Depression Announces Policy of Quantitative Cheesing), which boil down to stealth default by inflation and bank debts restructuring (overt default). Therefore the bailout (loan) just continues to delay the inevitable as it makes Irelands debt situation far worse, as another Euro's 100 billion of debt has been piled onto Irelands already huge debt mountain that Ireland can NEVER REPAY in real terms. The Euro-zone needs to develop mechanisms that allows member countries to go bankrupt in a more orderly manner without impacting on the rest of the Eurozone, this would make the Euro currency FAR stronger, and make future debt crisis events more localised to small economies such as Greece, Ireland and Portugal. Off course first the European regulators need to extract their bankrupting banks from the bankrupting PIIGS. It is a very messy situation, where financially immature nations were wrapped in the persona of the Euro, enabling their banks to virtually borrow unlimited amounts of money at ultra low interest rates. UK unemployment looks set to remain on an upward trajectory for the next 3 years, after which it should feel the effects of the election boom. However against these positives there will be the impact of European Migrant workers that could take up as much as 70% of the new jobs created, which suggests that even if the government is able to create its forecast 2.5 million jobs (which I doubt), then at least 60% of these jobs will go to migrant workers, leaving less than 1 million new UK jobs for British citizens. This does not paint a very rosy picture for the governments expectations for UK unemployment to fall to below 2 million. At least a 1/2 million flood of highly able and motivated workers from the bankrupting PIIGS to seek and find work in Britain ensures that the Governments expectations for UK unemployment to fall below 2 million is not going to be realised. Instead UK unemployment now has a greater probability of reaching as high as 3 million over the next 2-3 years as illustrated by the original forecast graph. The inability to combat rising unemployment will put Britain's finances under further strain despite all of the announced austerity measures as on average it takes approximately 4 tax payers to support each unemployed worker, so tax revenues from 500,000 migrant workers will not to any extent be able to cover the costs of unemployment rising by 1/2 million, so despite a growing economy, the workers of Britain will feel even less secure over the coming years than they did at any point during the Great Recession. The ultimate cost to Britain of 1 million extra unemployed (against government expectations) in large part as a consequence of migrant workers is estimated at £40 billion / Euros 48 billion over the next 3 years. The key lesson from Ireland is BIG BANKS Should be BROKEN UP!, Irelands THREE big banks have bankrupted the nation which collectively have liabilities at over 200% of Irelands GDP. NO lessons have been learned in Britain either, as on the one hand there is the giant bailed out Lloyds / HBOS monster and on the other hand the UK regulator has let Spain's Santandar run amok by gobbling up half a dozen small to medium sized banks. Which means more liabilities dumped onto UK tax payers when Spanish banks send Spain over the edge of the cliff! David Cameron's government is increasingly one of smoke and mirrors as I wrote earlier in the month (11 Nov 2010 - Is David Cameron a Socialist? Time for a Tea Party for Britain ? ). There is no sign that the Conservatives will do ANYTHING to prevent another financial crisis by breaking up the power of the big banks by ensuring that retail banks cannot become too large or be allowed to play in the global derivatives casino. Ireland's Euro 90 billion bailout follows Greece's 110 billion. The bond markets are suggesting that next is Portugal that is seeing its 10 year bond yields rise to 6.75%. The debt problem with Portugal is not as a consequence of a bankrupt banking sector but that the Portuguese economy is highly uncompetitive, and badly managed that in reality should never have been accepted as part of the Euro-zone along the same lines as Greece, as unlike Ireland there is no solution to Portugal's debt and deficits. However the good news is that a bailout of Portugal 'should' be far less costly, perhaps Euro 40 billion over the next 3 years. However after Portugal comes the really big problem economies of first Spain and then Italy. The inflation mega-trend continues to manifest itself as UK CPI nudged higher to 3.2% for October from 3.1%, whilst the Bank of England continued with its deflation threat propaganda so as to prevent a wage price spiral from taking hold. Whilst the highly doctored CPI came in at 3.2%, the more recognised RPI came in at 4.5% with real UK inflation still at a high 6% as illustrated by the below graph. Deflationists continue to play the pick and choose game so as to pretend they understand what is going on whilst the Inflation mega-trend passes them by (18 Nov 2009 - Deflationists Are WRONG, Prepare for the INFLATION Mega-Trend ) . One of the tricks utilised is to focus on core inflation that excludes food and energy costs, as if to imply that people have stopped eating and warming themselves therefore energy and food prices do not matter anymore, off course the reason they are being ignored is because they have risen sharply, and hence people do not have any money left over to BUY core inflation items and hence WHY core inflation is LOW and so the cycle repeats where the central banks focus on core inflation to imply deflation, use it as an excuse to PRINT MONEY which forces UP food and energy prices that acts as a TAX on consumption of core inflation items and off the central bankers run again on their self induced perpetual money printing deflation risk cycle! All central banks are engaged in the same money printing because of deflation threat game that benefits the big banks. I can imagine a day will come when the government starts to advocate that inflation indexation should be inline with Core CPI to further enhance the stealth real inflation fraud. For more on the Inflation Mega-trend and Deflation Delusion download the FREE Inflation Mega-Trend Ebook. The following excellent video explains how Fed deflation propaganda is used to convince the masses that printing money is good, which is then funneled to Goldman Sachs and other Wall Street Bankster's. Apparently according to the Ben Bernank, the secret to growing economies is by printing money and having fake inflation and unemployment statistics, as long as the banks profit he is all smiles. Robert Prechter has kindly exclusively made available to our readership FREE access to his recent Elliott Wave Theorist 10 page Newsletter. Download Prechter's FREE 10-Page Market Letter. (Download access available for a limited time period only). Last weeks analysis concluded in a continuing down trend as of the 11,380 trigger to target a low of 10,950 for a relatively mild correction (15 Nov 2010 - Bank of England Inflation Propaganda Suggests Invisible Depression, Bankrupting Ireland Seeks Bailout ). 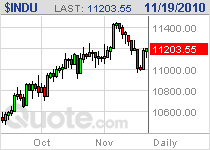 The Dow put in a low of 10,979 before rallying and closing on the week at 11,203. The big picture trend in line with the last in depth analysis (18 Oct 2010 - Stocks Stealth Bull Market Dow Trend Forecast into Jan 2011) is for a correction into Mid November to resolve into a rally that targets Dow 12k by Mid Jan 2011. Therefore the stock market has now entered the time window for the rally to 12k. The last Dow close of 11,203, puts the index about 300 points above its forecast trend by this point in time which suggests to me a volatile sideways to downtrend price action over the coming week that risks breaking the 10,976 low after Monday's bullish reaction to Ireland's Bailout. How long has the Stocks Bull Market left to run ? It is hard enough to see a couple of months forward, hence the in-depth analysis every couple of months or so. I still see the stocks indices such as the Dow targeting new all time highs, time wise, I am getting the impression that we could have passed the mid-way point, which suggests a 1 to 1-1/2 years to go before we have a bear market (of sorts), by which time time the perma bears will have thrown in the towel and turned into bulls or attempt to rewrite history and state that they called the 2012 stock market peak whilst having called virtually every correction as the end of the bull market for the preceding 2-3 years! Just as they did during previous bull market that peaked in 2007! How Bad Could the Bear market be? Now I really am gazing into the a fuzzy distant future by contemplating this question. The stock market is in an inflationary growth spiral, therefore the next bear market will be CORRECTING the current bull market and thus will NOT be the likes of 2008-2009. It is way too early but I can guesstimate a 50% retracement of the whole bull market over 1/3rd of the time. But lets enjoy riding and profiting from the STEALTH bull market first before we start worrying about the next 'corrective' bear market. Gold, Silver, Oil Quick Comment - Since many markets are highly correlated to stocks at this moment in time, gold, silver, and oil could also experience a volatile downtrend during the week after Monday's bailout bounce. Your stocks stealth bull market monetizing analyst.